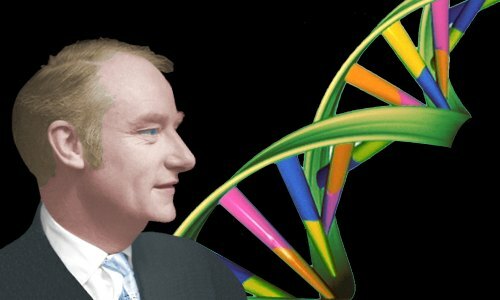 Francis Crick played a decisive role in the 1953 discovery of DNA’s double helix structure and its ability to replicate. Crick carried out further highly influential work in genetics, proposing the Sequence Hypothesis and the Central Dogma in 1958. In 1961 Crick and his co-workers discovered that DNA uses a triplet code to control the way amino acids are pieced together to form proteins. Francis Harry Compton Crick was born on June 8, 1916 into a middle-class family in Northampton, England, UK. He was the older of the family’s two children. His father was Harry Crick, who helped run the family shoe factory. His mother was Annie Elizabeth Wilkins, who had worked as a nurse and was the daughter of a self-made businessman. His parents belonged to a nonconformist Protestant church. Francis’s aunts and uncles played important roles in his life: Ethel, a schoolteacher taught him to read; Walter, an amateur chemist, allowed him to carry out experiments in his garden shed; and Arthur, who owned a number of pharmacies, paid Francis’s college fees after his father’s shoemaking business folded. Francis Crick’s education and his acclaimed wartime work are described here. At the end of the war, Crick served in Naval Intelligence for a short time before he felt an urge to return to scientific work, but he wasn’t sure what to do. He knew his war work was highly regarded – he had shown a remarkable ability to get to the heart of scientific problems and solve them – but he did not want to work on magnetic devices any more. The great mystery of life: how is the division between the living and the non-living decided? The great mystery of consciousness: how does the human brain work? Crick had been inspired partly by the great quantum physicist Erwin Schrödinger’s 1944 book What is Life? Schrödinger told his fellow physicists that the molecules of life were the great unexplored frontier. The Medical Research Council (MRC) awarded him funding for his second attempt at a Ph.D., but he found the work boring. One day his supervisor told him the MRC was going to fund research into biological molecules at the University of Cambridge’s Cavendish Laboratory – what did he think? Crick thought a transfer to the Cavendish sounded like a very good idea! In 1949, age 33, Crick began a third attempt to get a doctorate, and this time he hit the scientific jackpot. Crick’s lively scientific interests had impressed Max Perutz, who accepted him into his research group at the elite Cavendish laboratory. Perutz was using X-ray diffraction to study the 3D structures of proteins. Proteins are fundamental to life, and Crick was happy to study them. The director of the Cavendish was Lawrence Bragg who, four years before Crick’s birth, had discovered how X-ray diffraction can reveal the structures of molecules, showing the locations of individual atoms. Perutz, with Bragg’s help, was now extending Bragg’s techniques to huge biological molecules like proteins. Crick’s task was to use X-ray diffraction to discover the structure of hemoglobin, the molecule that carries oxygen in the blood. Crick taught himself X-ray diffraction theory before beginning work at the Cavendish. He learned the complex mathematics needed to transform X-ray patterns on a photo into molecular structures. In fact, Crick found he possessed a remarkable gift: he could look at a diffraction pattern, process it mentally, and visualize the shape of the molecule (in technical jargon the space group symmetry) that caused it. Soon after arriving at the Cavendish, Crick was able to correct some of Perutz’s already published ideas about hemoglobin’s structure. At his first seminar as a graduate student, Crick boldly told his experienced Cavendish colleagues that their X-rays methods, apart from one, were unsuitable for analysis of large biological molecules; he was correct. Crick delivered his message in his usual style – loudly and tactlessly – leaving Bragg, the inventor of X-ray diffraction, feeling professionally bruised by the arrogant 34-year-old new ‘kid’ on the block. The quiet Bragg found Crick’s loud laughter, his non-stop talking, and his apparent arrogance intolerable; he resolved to get rid of Crick the moment he finished his doctorate. Crick’s destiny changed in October 1951. Two years into his doctoral work at the Cavendish, the 35-year-old physicist met 23-year-old biologist James Watson. Watson, recently arrived from the USA via a short spell in Copenhagen, had a single overwhelming desire: he wanted to discover how DNA transferred heredity instructions from parent to offspring. DNA’s role as the carrier of heredity had been discovered by Oswald Avery and his colleagues in New York in 1944. Now, seven years later, scientists were slowly accepting the fact that genes – the carriers of instructions detailing how to build an organism – were DNA. In the summer of 1951, Watson attended a lecture given by Maurice Wilkins of King’s College, London. Wilkins showed an X-ray image of DNA taken by Raymond Gosling, his graduate student. The image set Watson on fire. It showed that DNA undoubtedly had a regular, symmetrical structure. Watson was now desperately seeking a scientific partner who understood X-ray diffraction and could help him discover that structure. He struck gold when he met Francis Crick, who was still trying to solve the mystery of life. Crick had likewise struck gold. Watson understood genetics and was utterly driven to discover DNA’s secret. The pair began to misbehave, ignoring the work they had been funded to do, devoting their time to DNA. In October 1951, Watson traveled to King’s College to attend a DNA colloquium where he heard Rosalind Franklin, Maurice Wilkins’ colleague at King’s College, discuss her X-ray analysis of a new DNA structure she had discovered – type B DNA. Watson was a newcomer to X-ray analysis. He didn’t really understand what Franklin said and didn’t write anything down. This was a key moment that could have changed the history of science. Franklin told her audience that B DNA had a “face-centered monoclinic” 3D structure. As we’ll see later, this would have been a game changer for Crick. But Crick wasn’t there. Watson remembered some of the things Franklin said her X-ray work suggested about the DNA molecule. He reported these wrongly to Crick, who decided they should build a scale model of DNA. Inspired by the example of Cal Tech’s Linus Pauling, who had discovered the protein alpha-helix structure by building a paper model, Crick said to Watson they should build a wire model of DNA. This was a much quicker method of seeing how a large molecule might look in 3D than spending months building a Patterson map – the method favored by Rosalind Franklin. Crick was also wary of the Patterson map approach because even after a map had been built, it still required considerable interpretation. Instead, he favored taking all known data and fitting it into a scale model of DNA to see if it really made sense. Crick and Watson built their model, then Crick phoned Maurice Wilkins, inviting him to Cambridge to see it. And so, in November 1951, scientists including Franklin, Gosling, and Wilkins from King’s and Crick & Watson from Cambridge got together. Crick and Watson had built a triple helix model. Franklin argued that her X-ray diffraction photos provided no certainty of a helix. Then, with distinct relish, she used her knowledge of chemistry to launch a polite but nonetheless devastating attack on Crick and Watson’s prototype model of DNA; their lack of chemistry knowledge had resulted in a number of blunders. Crick and Watson hoped to improve their model and asked the King’s people to collaborate with them on DNA, but Franklin and Gosling did not wish to. Wilkins later wrote Crick a letter turning down formal cooperation. When he received reports of the meeting, the Cavendish’s director Lawrence Bragg instructed Crick and Watson to stick to their officially funded work – Crick shouldn’t be messing around with DNA when he hadn’t even finished his doctorate! Fast forward just over a year to the end of January, 1953. Crick and Watson were still on the sidelines. They were doing nothing obvious on DNA, but were bubbling under the surface. A key DNA discovery had come from Erwin Chargaff of Columbia University in New York. For decades, scientists had known that a DNA molecule contains bases (in the acid/base sense). There are four bases in DNA: guanine, cytosine, adenine and thymine – abbreviated G, C, A and T.
the relative amounts of G, C, A and T change from species to species, supporting Oswald Avery’s evidence that DNA is the molecule of heredity. whatever species DNA is taken from, there is always a 1:1 ratio of G:C and a 1:1 ratio of A:T.
On hearing about the 1:1 ratios Crick instantly had an idea that seems to have escaped Chargaff. Crick envisioned DNA as a molecule in which guanine and cytosine are paired with one another, as are adenine and thymine. This pairing suggested to him that DNA replication might involve a complimentary – i.e. lock and key – mechanism. In fairness to Pauling, he was working from old, lower quality X-ray diffraction photos. Nevertheless, the fact that Pauling was working on DNA set alarm bells ringing for Bragg. Pauling had beaten him to the protein alpha-helix structure, and Bragg was determined Pauling would not win again. This was driven partly by professional pride and partly by personal resentment: Bragg believed that Pauling had once presented Bragg’s ideas as his own. Frustrated that Franklin and Wilkins at King’s College seemed to be piling up data, but making no progress interpreting it, Bragg let loose his maverick DNA fanatics Crick and Watson. It was now a race. But not everyone in the field knew it. Rosalind Franklin, a methodical perfectionist, who was scheduled to leave her job at King’s in March, had long refused to build a scale model of DNA. She now tentatively started one. She was barely communicating with her colleague Maurice Wilkins. Crick and Watson, meanwhile, were fizzing with ideas – arguing and communicating freely – making meaningful progress with their DNA model. Franklin had been unhappy working at King’s for some time and was moving to London’s Birkbeck College. In December 1952, she wrote a report for the MRC summarizing her DNA findings. Crick’s supervisor, Max Perutz, and Crick were also doing work supported by the MRC and, quite correctly, received a copy of the non-confidential report in February 1953. When Crick read it, he saw for the first time the key words “face-centered monoclinic.” He would have been aware of these words a year earlier, if only he had attended the seminar at King’s. Crick recognized DNA’s space group must be monoclinic C2, one of 230 possible arrangements a crystal could have. He had discovered exactly the same arrangement in horse hemoglobin. Having already figured out what it meant for horse hemoglobin, he now saw exactly what this space group meant for DNA – something Wilkins, Franklin, Perutz, Bragg, Watson, and a host of other scientists had not seen. In his mind’s eye he could now see the symmetry of a DNA molecule: two helices that formed a dyad. The dyad symmetry meant that if the double helix structure were rotated through 180 degrees, it would look the same as it did before the rotation. So, although Crick and Watson had done no substantial experimental work themselves, they were now ahead in the race. In their possession they had data from Franklin, Wilkins, Chargaff, and others – others whose names are often unsung when the tale of DNA is told. Crick could now approach the scale model of DNA with a degree of certainty. He knew there was a double helix dyad. He knew its role was to support the G, C, A, and T bases – the four letter alphabet that spells out the words, sentences, and paragraphs of life at the molecular level. Diffraction work by William Astbury and his colleagues at the University of Leeds spanning the 1930s and 1940s had shown that the bases were stacked ‘like a pile of pennies’ attached at 90 degrees to the supporting structure. Work done by Sven Furberg at Birkbeck College suggested the G, C, A, and T base units lay within the double helix, while another chemical unit, the phosphate group, would lie on the outside of the structure. Franklin’s work verified the work of the earlier researchers and, moreover, supplied DNA’s space group and excellent data about spacing between chemical groups in DNA. Watson now stepped up to the plate. Working on the scale model, he had been struggling to fit the awkwardly sized base pairs within the supporting structure of the double helix. He chatted about the bases with Jerry Donohue, a researcher from Cal Tech who was spending time working at the Cavendish. Donohue said the textbooks Watson was using were wrong. Although Donohue knew nothing about DNA, he knew about bases. Watson went back to his model and then had his own moment of revelation. He saw that, with appropriate hydrogen bonding, T paired with A was identical in shape to C paired with G. This meant that each base pair would fit anywhere within the double helix: a DNA molecule could be strikingly regular even though the sequence of base pairs was irregular. 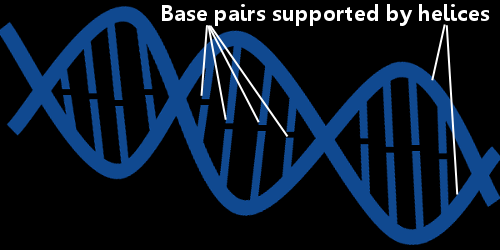 The hydrogen bonds between the base pairs would hold the two helical chains together. The revelation went further: the shape of the double helix meant that T could only pair with A; and C could only pair with G. Other pairings were not possible. This explained Chargaff’s 1:1 base ratios: the ratios meant exactly what Crick had envisioned when Chargaff told him about them – DNA replication involves a complimentary – i.e. lock and key – mechanism. Crick and Watson were now on fire. Everything made sense. Watson identified how the base pairs holding the two helices together would have the same 3D shapes. Crick now painstakingly put together an accurate scale model. All the potentially awkward units fitted perfectly. He completed it on March 7, 1953. Wilkins was invited to see the model on March 13. He saw that it was perfect and his reaction was anger. Although at an earlier meeting he had grudgingly accepted Crick and Watson were re-entering the race, he thought it was a race he could win. He rejected their offer to co-author a paper with them. In the end, the heads of the King’s and Cavendish laboratories agreed that three separate papers would be submitted to Nature – Watson and Crick’s paper discussing their model plus papers from the King’s College scientists Franklin & Gosling; and Wilkins, Stokes & Wilson; describing their X-ray work. In their Nature paper, Watson and Crick cited other researchers such as Chargaff, Astbury and Furberg. They acknowledged help from Wilkins, Franklin, and Donohue. Many observers came to believe that as an absolute minimum the data from King’s should have been acknowledged more generously and specifically, or better that Franklin should have been offered co-authorship. All three papers appeared in Nature on April 25, 1953. In May 1953, Watson and Crick published a further paper in Nature explaining how DNA replicates. Acceptance of Watson and Crick’s work came slowly, but soon enough they were famous. Wilkins got over his initial huff. He resumed his previous friendships with Crick and Watson. Crick and Franklin became good friends. Crick, Watson, and Wilkins shared the 1962 Nobel Prize in Medicine. Rosalind Franklin died in 1958, and Nobel Prizes are not awarded posthumously. Crick’s work with Watson was the pinnacle of his career – it was the biggest biological discovery of the twentieth century. Crick completed his Ph.D. in 1954 and continued working at the Cavendish – Bragg no longer wanted to get rid of him! In 1958, Crick wrote On Protein Synthesis describing his highly influential Sequence Hypothesis. He proposed that any specific sequence of A-T-C-G bases in DNA is a code for building a specific amino acid sequence in a protein. He predicted that an adaptor would be discovered that carries information from DNA to protein. The adaptor was indeed discovered – transfer RNA. Crick also proposed his Central Dogma, that information flows in only one direction – DNA to protein and not protein to DNA or protein to protein. In 1961 Crick proved his Sequence Hypothesis. Working with Sydney Brenner and Leslie Barnett, he discovered it takes three bases in a DNA molecule to provide the code to add one amino acid in a protein: the genetic code is a triplet code. Crick continued working at the Cavendish until 1976. At the age of 60 he moved to the Salk Institute in La Jolla, California. There he investigated the second great mystery that had intrigued him for so many years – consciousness and the brain. On February 18, 1940, soon after beginning his war work, Crick married Doreen Dodd, an English literature graduate. They had one son, Michael. By the end of the war, the marriage was over. Doreen went to Canada with a Canadian soldier, and Michael went to Northampton to be raised by Crick’s parents. In August 1949, Crick married Odile, a French fashion designer. Michael attended boarding school and lived with Crick and his step-mother during vacations. Crick disapproved of the idea of kings and queens and for this reason he turned down a knighthood when one was offered to him. Francis Crick died age 88 of colon cancer on July 28, 2004 in San Diego, California. His ashes were scattered on the Pacific Ocean. He was survived by Odile, Michael, and two daughters he had with Odile: Gabrielle Anne and Jacqueline Marie-Therese. "Francis Crick." Famous Scientists. famousscientists.org. 17 Aug. 2016. Web.